In the annals of disheveled TV detectives . . . well, there actually haven’t been that many of them. Dysfunctional? Yes. But Columbo in his famed rumpled raincoat is pretty much first and foremost among crime solvers who look as though they’ve just rolled out of bed with little thought of any further upkeep. 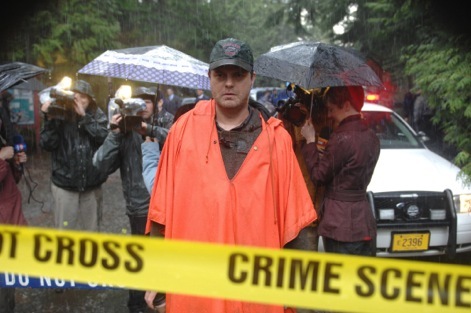 The title character in Fox’s Backstrom easily trumps Columbo in terms of looking like hell. They share a fondness for stale cigars, but Everett Backtrom’s orange-ish sack of a poncho and overall sub--slovenly appearance make Columbo seem like a Brooks Brothers fashion plate. Rainn Wilson, who came to fame as the vain, persnickety Dwight Schrute on NBC’s version of The Office, plays the title role with a hammy staggering swagger that turns out to fit him very well. He’s all over this part, whether willingly brandishing a decidedly doughy physique or firing off dictums, insults and asides that keep this series from ever bogging down. Three episodes were made available for review. They’re all solid, with the third in line, “Boogeyman,” offering a particularly riveting kidnapping case while also bringing Dennis Haysbert’s supporting character to the fore. Almond takes this in stride because he always has Backstrom’s back. Their relationship is among this series’ many strong points, particularly when Almond has a heart-to-heart talk with his partner in Episode 2. The series is set in Portland, Oregon, where the oft-rainy weather is also something of a supporting character. Backstrom otherwise isn’t about to let any smiles be his umbrella. His health issues, sparked by heavy drinking and a horrid diet -- wait’ll you see a diner’s “Full Backstrom Breakfast” -- have put him in a doctor’s care and initially in the Portland cop shop’s traffic division. It doesn’t help that he’s never played well with others. But his crime solving deductions still have a way of putting him back in play. Backstrom’s nicely put together ensemble also includes young detective Nicole Gravely (Genevieve Angelson), with whom he constantly clashes; patience-testing forensics specialist Peter Niedermayer); dogged uniformed detective Frank Moto (Page Kennedy) and in-house tech specialist Nadia Paquet (Beatrice Rosen). Backstrom also has a young gay tenant, Gregory Valentine (Thomas Dekker), who doubles as his “decorator” and underworld informant. The dialogue regularly crackles in Thursday’s premiere, during which a seeming suicide by hanging of course ends up being more than it seems. “Had a lot of threesomes, Moto?” Backstrom asks during the investigative process. “Regular amount is NONE,” Backstrom snaps. “Thank you, sir,” he replies in all sincerity. What you’ll see is the best broadcast TV cop drama of the season, with a dirty-to-the-touch sleuth played to the hilt by an actor who’s very much up for this. Rainn Wilson has found a role that fits him like an ugly, stretched-out poncho. And there’s no stifling him now.